If you are looking at a more Country Style Living you may want to take a look at the homes in Corrales. I specialize in assisting Buyers and Sellers in the Corrales area. My website contains ALL the listings from ALL Real Estate Agents, there's no need to look anywhere else for your next home. 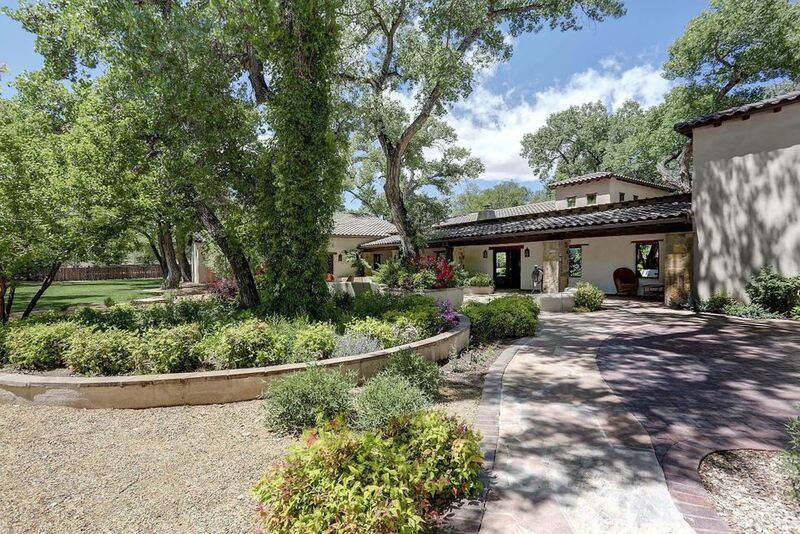 "Travel Down a Cottonwood Lined Lane and Be Transported to Another World * Behind the Custom Metal Gate a One of a Kind Compound Awaits on Three Glorious, Wooded, Fenced Acres Abutting the Bosque and River * Understated Elegance in a 5981 SF Main House, 1605 SF Casita, and 1655 SF Guest Quarters/Gym/Office * Fully Walled Swimming Pool with Bath House * Eight Garage Spaces * Three Stall Horse Barn with Tack Room * Direct Horse and Walking Access to Bosque Trails * The Main House Is a True Work of "
"One of the finest homes in New Mexico. 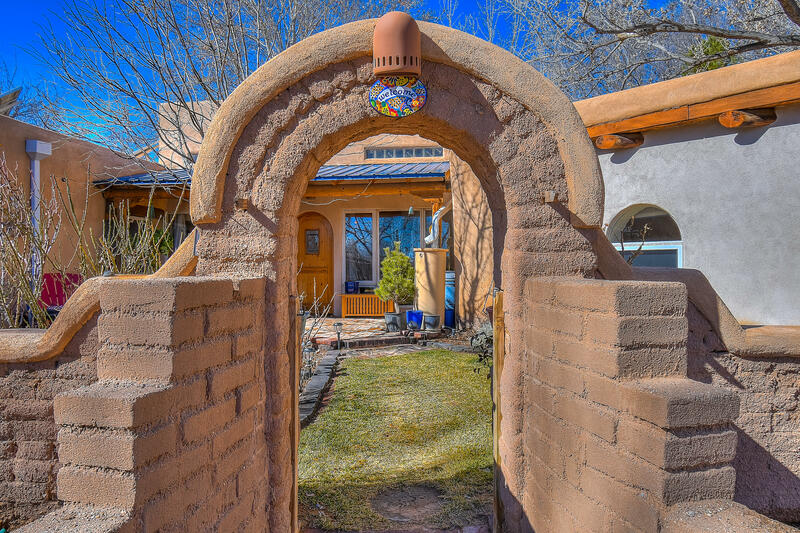 This architectural gem is a creation of one of New Mexico's most innovative and creative builders, as their family home. 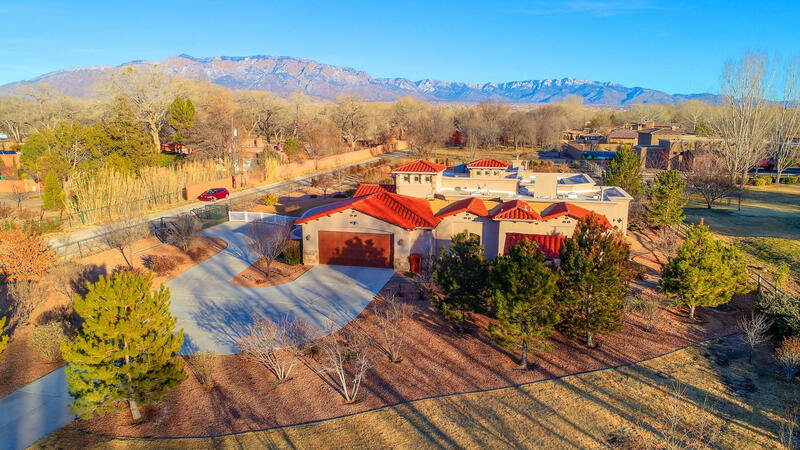 It is a blend of Southwest & Mediterranean design accentuating magnificent views of the Sandias, the Bosque, the Balloon Grounds and Greater Albuquerque. The house is situated in toney Corrales and is convenient to all locations in the metro area. 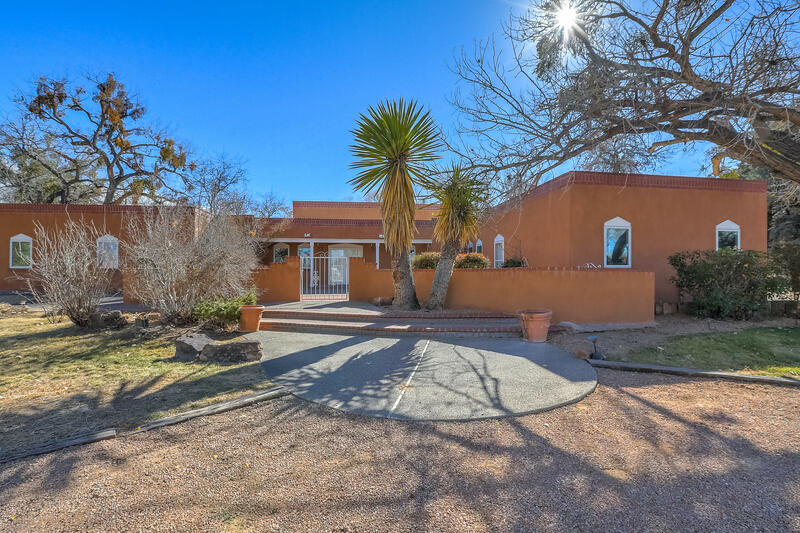 The west mesa location facing SE has gorgeous sunrise views of the Bosque & Sandias flowing "
"Turn-key and ready for accomplished horseman. 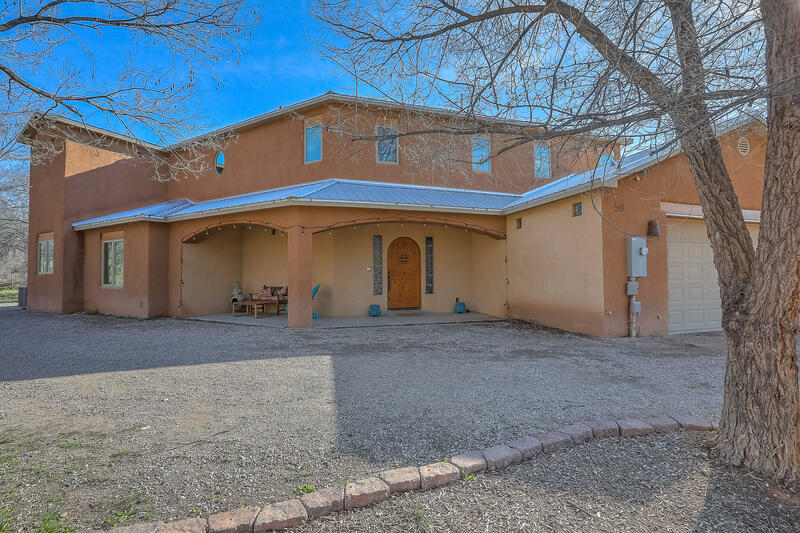 This horse training facility, conveniently located NW of Alb, & 45 minutes S of Santa Fe, in Corrales, features 7 acres w/ fully equipped 11- stall barn w/off. & apartment.10 runs w/cover, 7-stall foaling barn/shop, 80 X 150 covered arena, turnout, round pen, plenty of irrigated pasture! w/MRGCD. A fabulous custom home w/sep. casita, 2754 sf home features, 3 BR, 2.50 BA, 2 CG. Well designed for spacious living. Beautiful tile floors, high ceilin"
"Take a step back in time when you enter this stunning Spanish hacienda with Moroccan and Mexican influences. Behind this Old World luxury you will find the latest in technology and utilities. Open floor plan perfect for entertaining. Astonishing grand chef's kitchen with inset cabinetry, Brazilian honed granite countertops & Viking appliances. Soaring ceilings range from 10 to 16 feet with 8-foot doors. 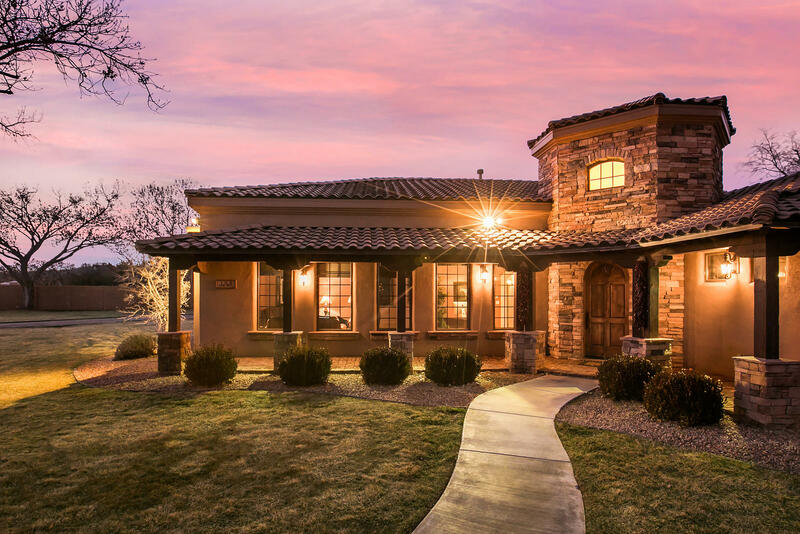 Broken brick accents, stone columns & walnut grid flooring inlayed with tumbled clay brick s"
"Stunning home in Baja Corrales (very south end) on 3.5 manicured acres. 3,820 sq ft main house features a great room with double sided fireplace, Owner's suite in separate wing with walk in closest and updated bath. All adobe property includes a handcrafted exposed 4 stall barn plus workshop. One of only two properties for sale in Corrales with guest house plus second guest house/studio. This property is tucked away on a private road that has only 5 homes spread over 14 acres for very private"
"AVAILABLE FULLY FURNISHED! SEE FLOOR PLAN IN PHOTOS AND MATTERPORT 3D IN PICTURES. Exquisite East Side Green Gated Corrales Estate tucked away amid lush cottonwoods; short stroll to shaded Bosque paths & Rio Grande River. Luxuriously renovated hacienda offers privacy & serenity. Gracious flowing open living, dining, kitchen spaces with separate formal dining & dedicated media/family room with full bar. Professional Caterer's delight Kitchen with top of the line equipment & layout. 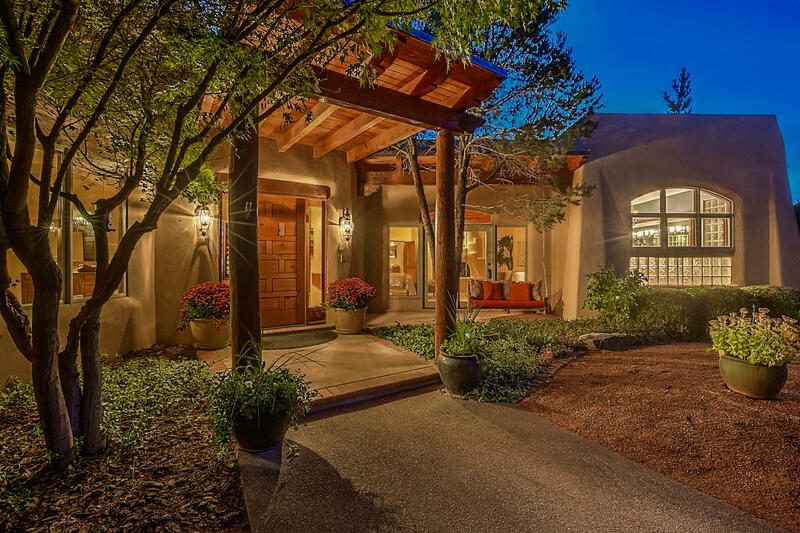 Flowing indoor"
"Welcome to 100 Camino de Los Arboles.Nestled in a luxurious setting with the Bosque at your fingertips. 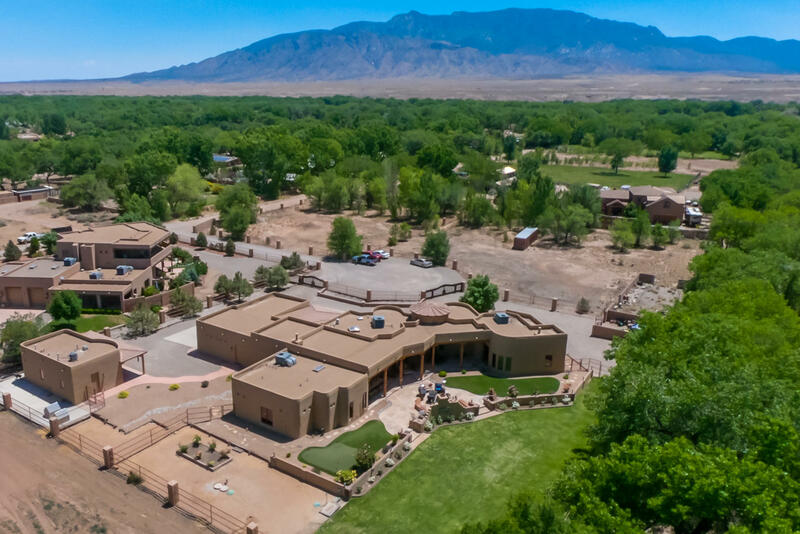 This private Estate sits perfectly on 2.18 Acres -amongst cottonwood trees, sprawling landscape and piercing views of our beloved Sandia Mountains. -Walk, run, bike and ride your horse on tree lined trails. This 4,162 square foot home offers 3 bedrooms, all with private en-suite baths and walk in closets. 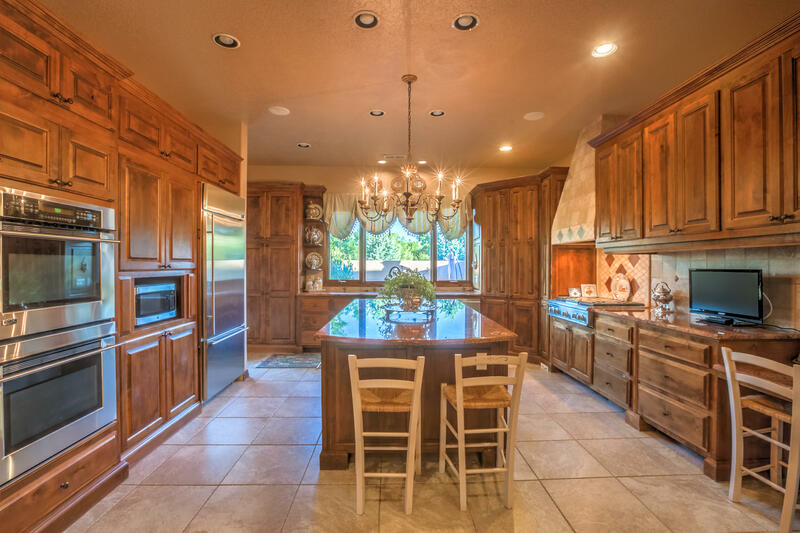 The kitchen features Alder cabinetry, Granite countertops and Wolf Sub-Zero appliances, "
"Stunning, custom built home on .89 acres in Corrales W/beautiful mountain & Bosque views! This sprawling floorplan has it all - formal living & dining rooms, gourmet kitchen, office/study, family room, media room, game/exercise room, master suite, 2 additional bedrooms each w/own bath, 7 car garage. Kitchen has large island w/2 five-burner cooktops & prep sink, SS appliances including 2 double ovens & a sub-zero refrigerator, 3 pantries, large breakfast nook. 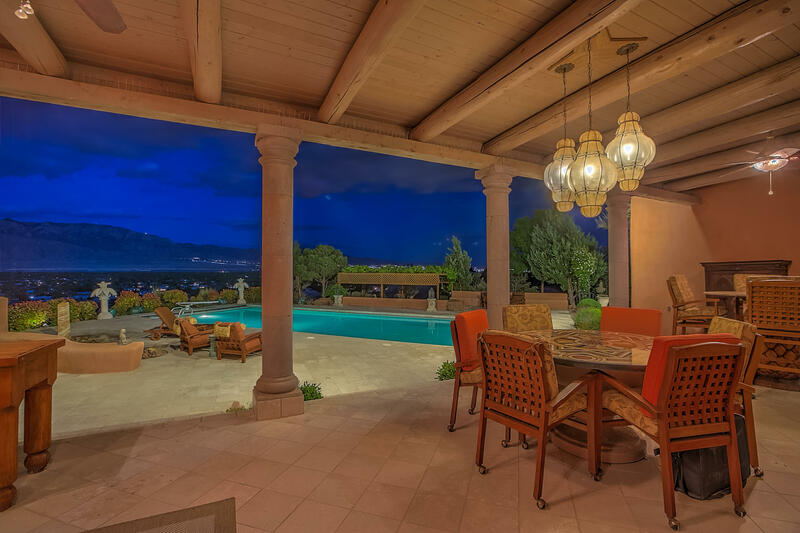 Master retreat offers sitting area, "
"CORRALES BEAUTY!! Don't let the address fool you! Home faces Morningstar and sits well away from Corrales Rd!! 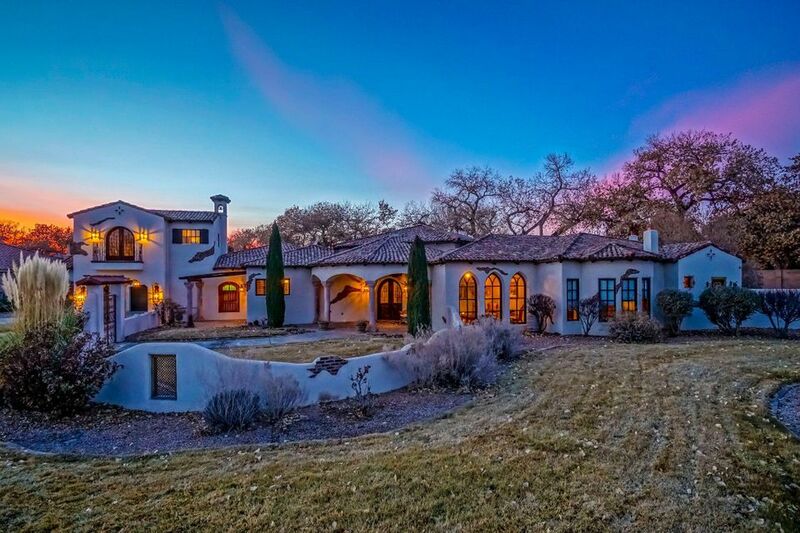 Gorgeous Custom Home Built in 2012 sits on 2.15 AC with wonderful views of the Sandias! Every corner of this home and lot were carefully and meticulously thought out! Home has two master suites! The main master is 20.6 X 20.8 w/ His/Hers Closets, Gas FP. Office/3rd BR with built in bookcases. 215 SF Sunroom off the master is heated/cooled but not included in SF. 12' Ceilings in LR an"
"This mission style home was completely renovated for most discriminating taste keeping the structure consistent with hand placed Adobes. 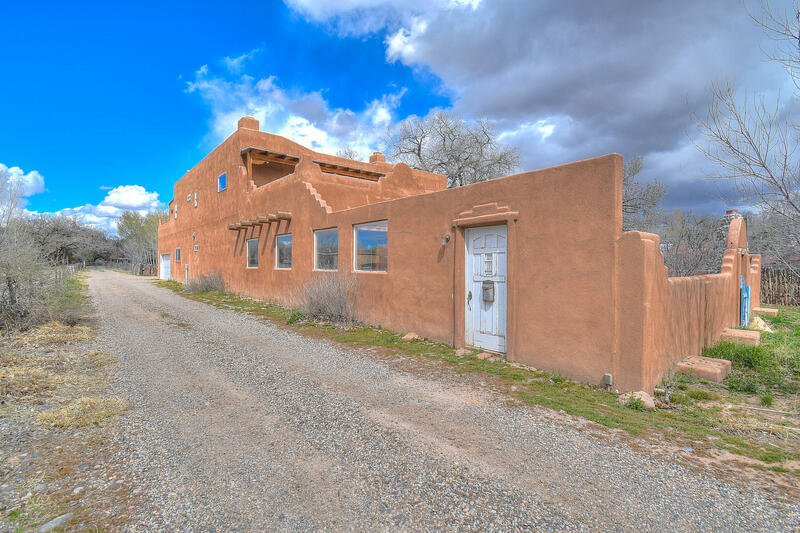 You will immediately feel warmth of the surreal adobe walls when you step inside. located in the peaceful, warm, farming village of Corrales. 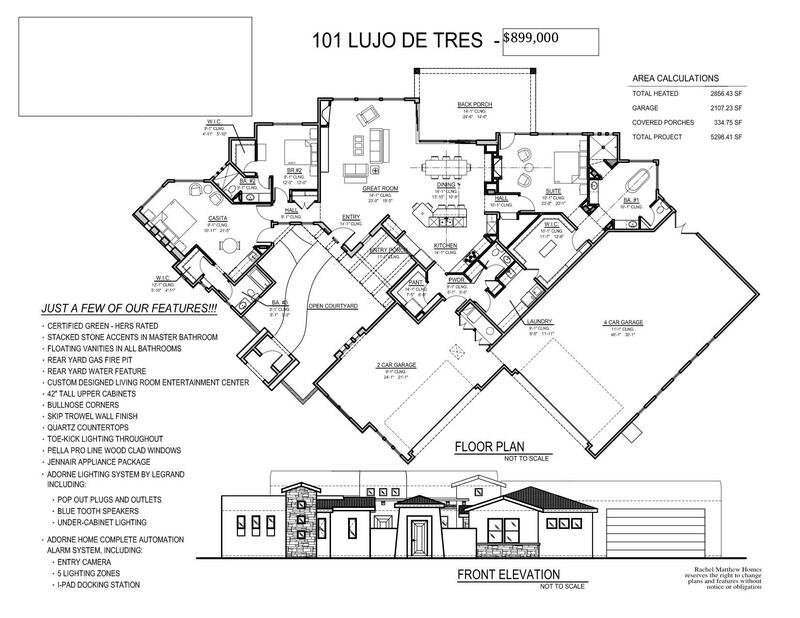 Open bright floor plan, with Vigas and Latilla ceilings. Stunning custom kitchen with all the equipment required for the discriminating chef, granite, all Wolf appliances, Sub-zero refrigerator, wine cooler, radiant heat"
"Looking for something special? 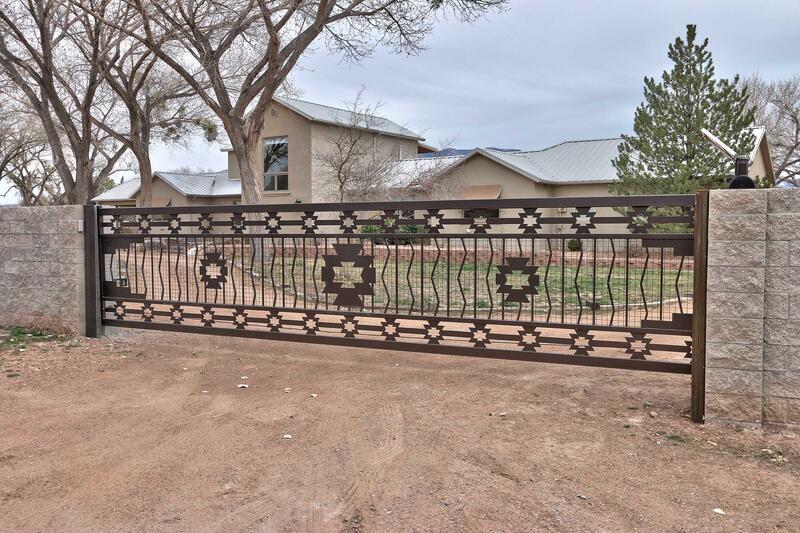 Beautiful, bright and inviting custom Pueblo-style home on one acre. Gated, fenced and landscaped. Enjoy the centrally located Corrales greenbelt location on Caliente De Sol - a Private cul-de-sac off of Cinco Milagros and Price Lane. Lovely mountain and colorful views from the strategically placed oversized windows and balcony. Fabulous knotty Alder cabinetry, tall ceilings and storage galore! 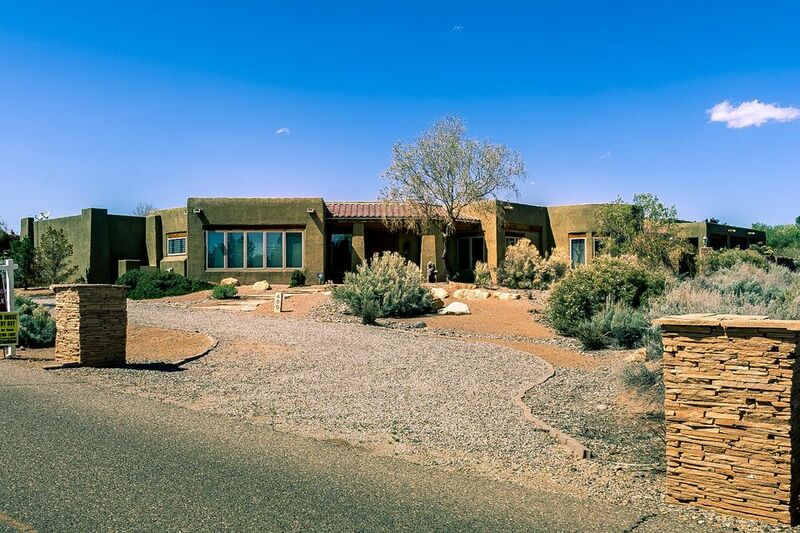 A Chef's kitchen features double ovens, warmer, oversized pantry, appli"
"Tree Canopied Mariquita Lane is a Corrales favorite & leads you to a Corrales Estate with BOSQUE ACCESS. Large Pella windows frame MOUNTAIN VIEWS! 3 living areas, 6 generous bedrooms, Stunning Master Suite & a Chef's Dream Kitchen, there's room for everyone. This ENTERTAINER'S DELIGHT boasts Viking appliances, Ernest Thompson cabinets, granite countertops, large capacity refrigerator with matching solid wood cabinet panels, 8 burner gas stove with griddle, double ovens, warming drawer, beverage "
"Come home to the serene views of the Sandia Mountains! 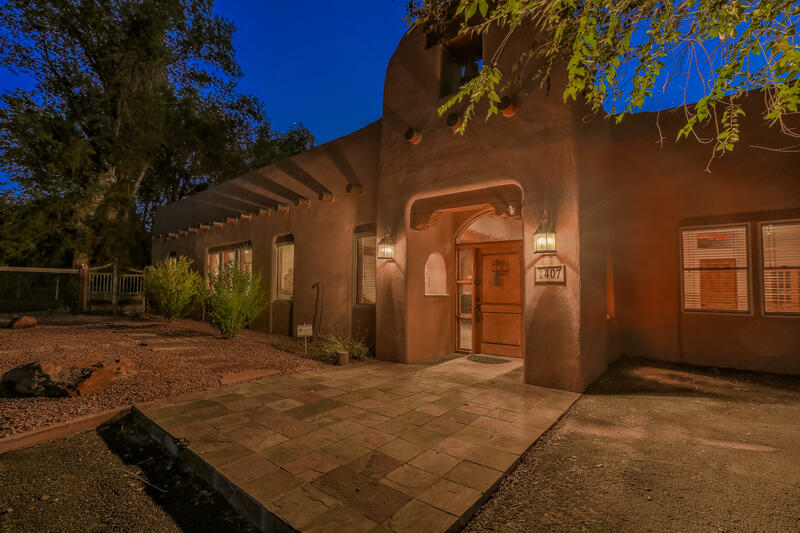 Nested in the gorgeous Corrales Village is ONE OF A KIND property. This property is zoned for residential AND commercial use. Reference MLS# 941077. The main home is toward the back of the property and has PLENTY of characteristics! 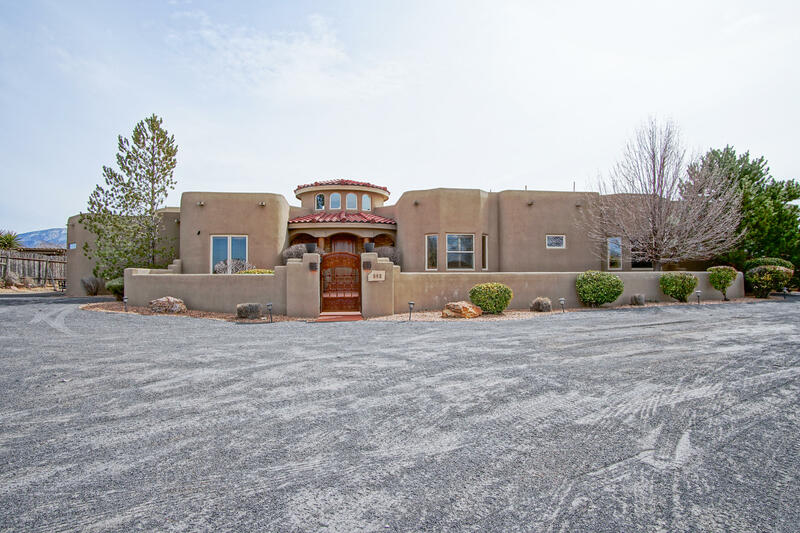 Features of the home include a beautiful rotunda, custom vigas, 4 kiva fireplaces throughout, 2 living areas, an in-law suite, lots of storage closets, and a office on the 2nd floor. Outside of the home there is "
"Exquisite Estate offers amazing level of luxurious amenities! Old world Charm traditional hacienda with courtyards! Gracious living room boasts travertine flooring/cathedral ceiling! Wood burning FP/stone mantle! 3 spacious Living areas! Brick arch into formal Dining/custom chandelier/Picture view window of the Mountains! Gleaming hardwood floors! Chef's delight kitchen is truly the heart of the home! Maple Cabinetry/FULL size Freezer+Refrigerator/High end SS appliances/Large pantry! Ideal mu"
"This stunning custom home is an entertainer's dream with a large, open concept kitchen and living room, beautiful stonework and high ceilings throughout. Relax out back on the large covered patio complete with a built in grill, swim in the fabulous custom pool, play basketball on your own court or soak in the brand new hot tub. Come see the enormous 2400 sq ft SEVEN CAR GARAGE ready for all of your toys or RV. Master bedroom has an extended area for an office or gym equipment. Master bath is li"
"Amazing custom home and stunning views, Huge covered patios with large swimming pool. 5 Bedrooms plus an office, Billiards/Game Room. Cathedral ceiling, tile hardwood floors. Over sized windows, Hugh walking closets. 3 Refrigerated A/C Units. Outdoor BBQ Grill." "Gorgeous mountain views. 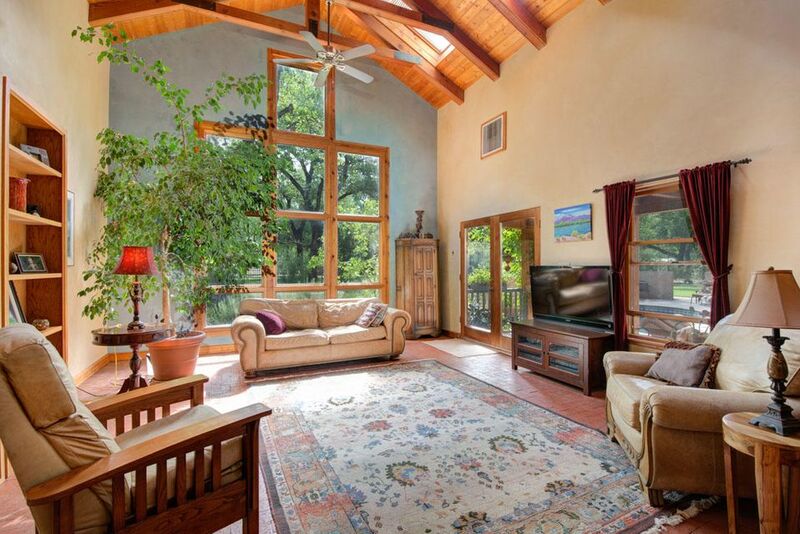 Direct access to the Rio Grande & the endless hiking, biking riding trails of the bosque, this Northern New Mexico-style custom home comes flooded w/ natural light. Custom wood windows & doors, Bosch appliances, radiant & central forced air, 20'' X 20'' porcelain tile throughout, including curved stairwell, baseboards & showers. Open floor plan leads to a private flagstone patio w/ kiva fireplace. 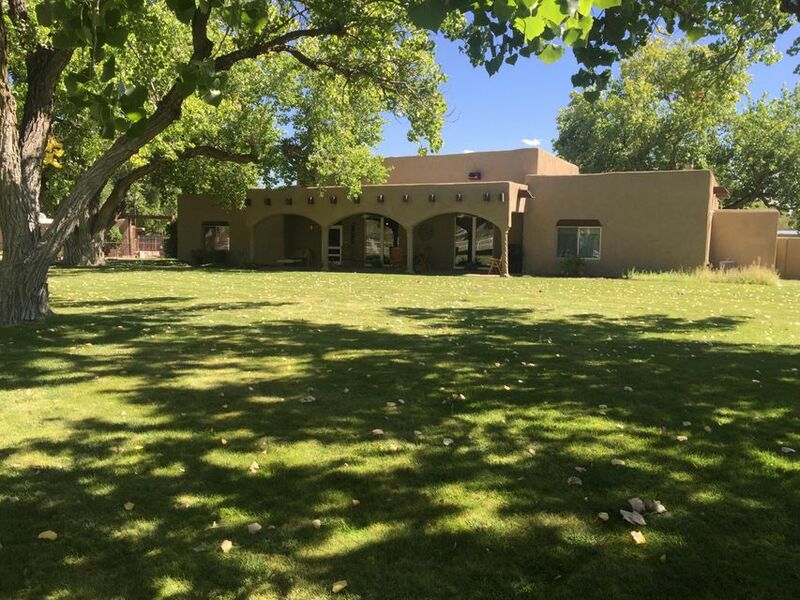 Tree-lined street leads to this walled & gated 2+ acres which comes comple"
"Don't miss out on this picturesque 2.25 acre estate in Corrales Del Norte with sprawling lawns and big trees. Equestrian enthusiasts will cherish the 4 stall barn, tack rooms, hay storage, office, turn out pens and room for an arena. Close to the Bosque, the trails are numerous. The recently refreshed home features a large living room with a high wood ceiling and kiva style fireplace, a second living area is cozy and warm with a 2nd kiva fireplace. The bright and spacious kitchen offers plenty o"
"This home has it all!!!! 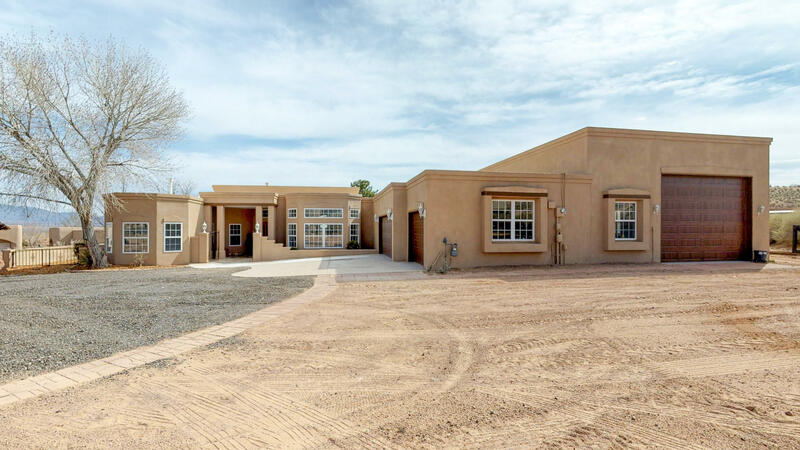 ''Lots of space for your family and lots of space for your toys''Come and take a look of this fully remodeled custom home located on the NW side of Corrales. This home features an oversized RV garage with drive thru garage doors ''with 1/2 BTH' plus a 3 car garage. In the inside, enjoy the warm feeling of an open floor plan and a brand new kitchen that opens up to the nook, all the living areas, and enclosed sunroom. 4 BR, 3BTH and two living areas on the main floor." 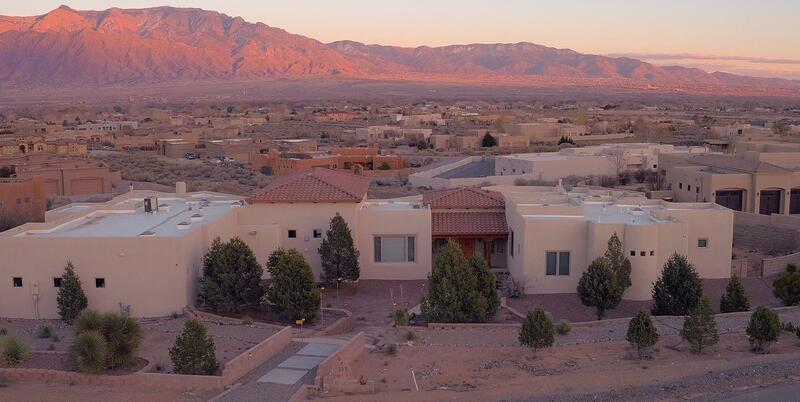 "Gorgeous and custom with Balloon Fiesta views! 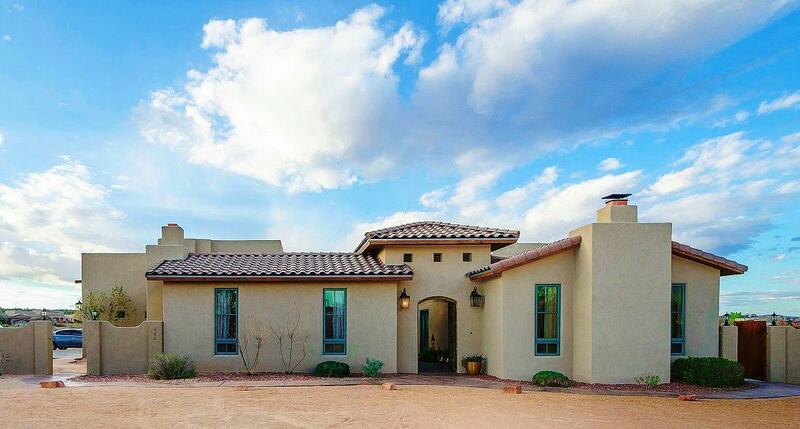 This home has everything you're looking for in the Corrales lifestyle. Custom built home with spectacular views. Located just next door to an attractive vineyard on a beautiful tree-lined st close to the Bosque. Fully covered patio with outdoor kitchen. 2+ master suites. Jack & Jill bathroom in the 2 guest rooms. Separate den, office/game room/music room with bathroom attached. 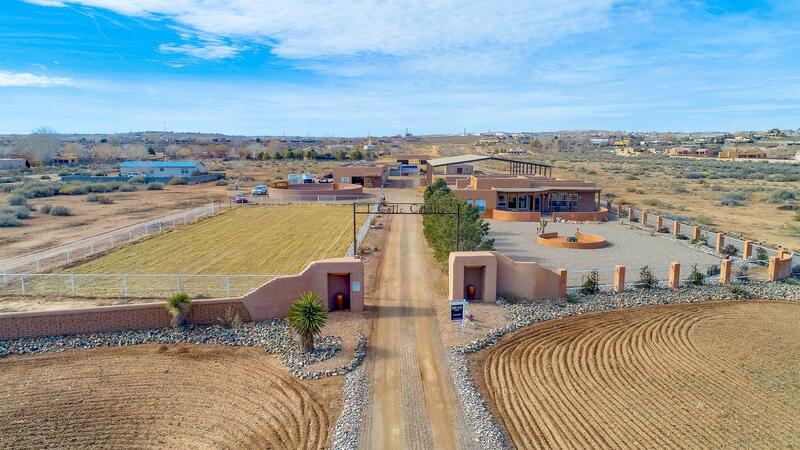 Plenty of room to make this property your own without traditional Hoa re"
"Absolutely stunning exquisite one owner custom home overlooking Corrales Vineyards Winery and Apple Orchards! Private cul de sac lot with breathtaking panoramic mountain views from this gorgeous home. Custom plaster wall finishes, granite counter tops, chef's dream Kitchen Jenn Air appliances w/6 burner commercial convection stove and so much more, outdoor BBQ w/custom fireplace! ~1700' (heated/cooled) 4 car with RV garage and storage. 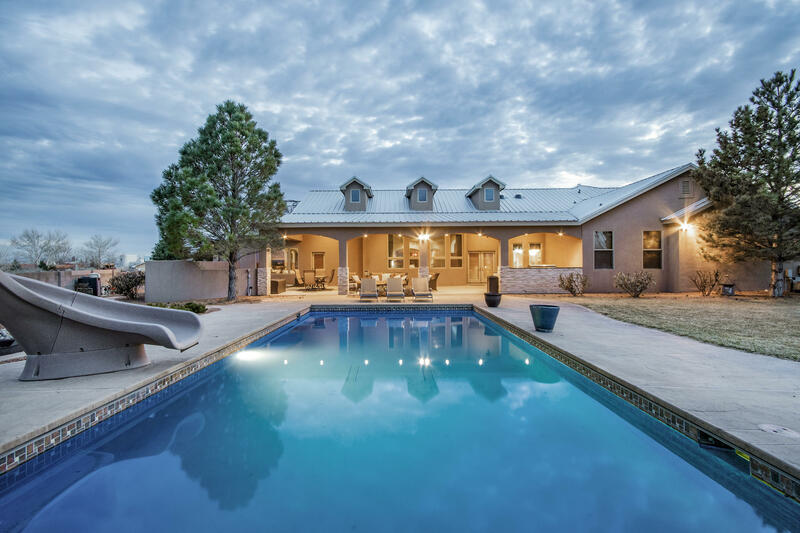 The open living concept is perfect for all your entertaining"
"Picturesque Multi-Generational South End Corrales Adobe/Frame Horse Casa on 2 Lush Irrigated Acres. Architect Designed. Stunning mountain views. 3 Bedroom Main House AND spacious attached 2 Bedroom Casita. Corrales is the ''Horse Capital of New Mexico'' & voted top 20 places to live by Money Magazine. Overflowing with charm and character...Nichos, Kivas, Beams & functional Vigas, 6 Panel Solid Wood Doors. Owners' suite in separate wing replete with walk-in closet, walk-in shower, two sinks, ant"
"An oasis under a canopy of shade trees with truly amazing in/outdoor living spaces & lush vignettes around a relaxing pool and jacuzzi. Northern NM mini estate features a main house, a separate heated & fully plumbed artist studio, optionally a private 4th family BR or guest house. Stunning architectural details inside the home are endless! After being greeted by a private front courtyard, you find warm brick floors, plaster walls, & enormous great room with cathedral ceiling. Carved wood tree "